The Foundation framework does what its name suggests. It provides the building blocks for OS X apps. The framework includes a large amount of classes and protocols. NSArray, NSURL, NSUserNotification, and so on. You may not be familiar with those classes, but their names hint at what they do. Because of its importance, you can use its classes without needing to import it in new apps. They are available by default. Note: You need Yosemite Developer Preview 7+ for the examples to work. The best way to get going is to jump in and build something. Iâ€™m going to walk through building a small app that lets you display an image from your computer. You can download the completed example from my example apps repo. A screenshot of the app weâ€™ll build. Making up the app is; a window, text label, text input, and button. Or by their class names; NSWindow, NSTextField, NSTextField, and NSButton. 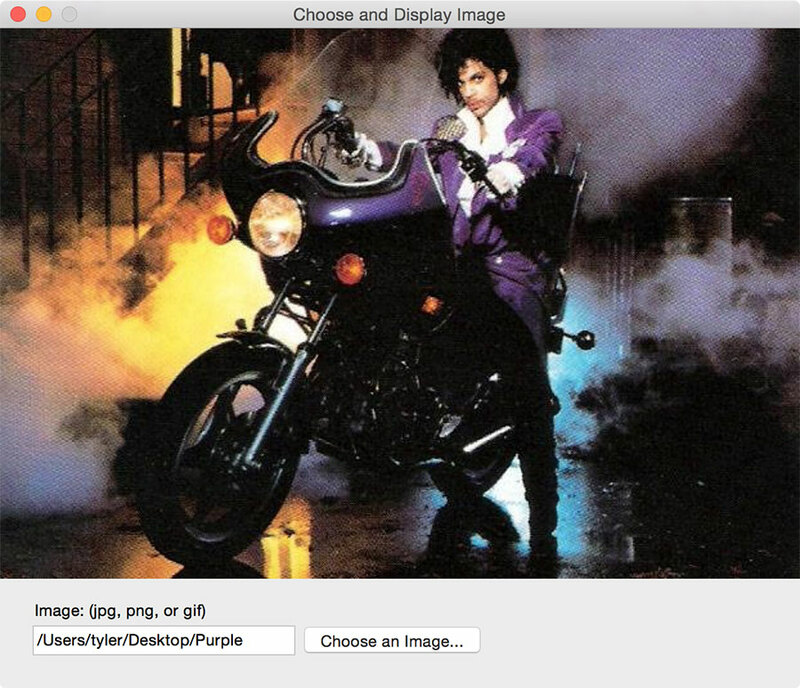 Clicking the Choose an Image button will show an NSOpenPanel that allows you to select a file. Weâ€™ll configure the panel to restrict the file selection to .jpg, .png, or .gif. After selecting an image, we'll display it in the window. The window will resize to match the width and height of the image plus the height of the controls. Weâ€™ll also set a minimum width and height for the window to make sure the controls donâ€™t get cut off. Open the Apple Script Editor application located in Applications > Utilities. Script Editor ainâ€™t the best editor Iâ€™ve ever used, but itâ€™s necessary for now. It has a bunch of features that we need for building JS OS X apps. Iâ€™m not sure what goes on beyond the scenes, but it can compile and run your scripts as apps. It also creates extra stuff that we need like an Info.plist file. My guess is there are ways to make other editors do the same, but I havenâ€™t looked into it yet. Create a new document with File > New or cmd + n. The first thing we need to do is save the document as an application. Save with File > Save or cmd + s. Donâ€™t confirm the save right away. There are two options that are necessary to make this run as an application. Change the File Format to â€œApplicationâ€�. Check the â€œStay open after run handlerâ€� option. Itâ€™s important to set both of these options the first time you save the file becauseâ€“as far as I can tellâ€“there is no way to set them later. If you miss one of these youâ€™ll have to create a new document and copy your code over. If anyone knows a way to change the settings after creation, let me know. Update: A nice person explained how to update the settings. Open the File menu and then hold down the option key. That will give you the â€œSave as...â€� option. The save dialog allows you to make changes to the settings. Itâ€™s still best to set these on first save to avoid the hassle. 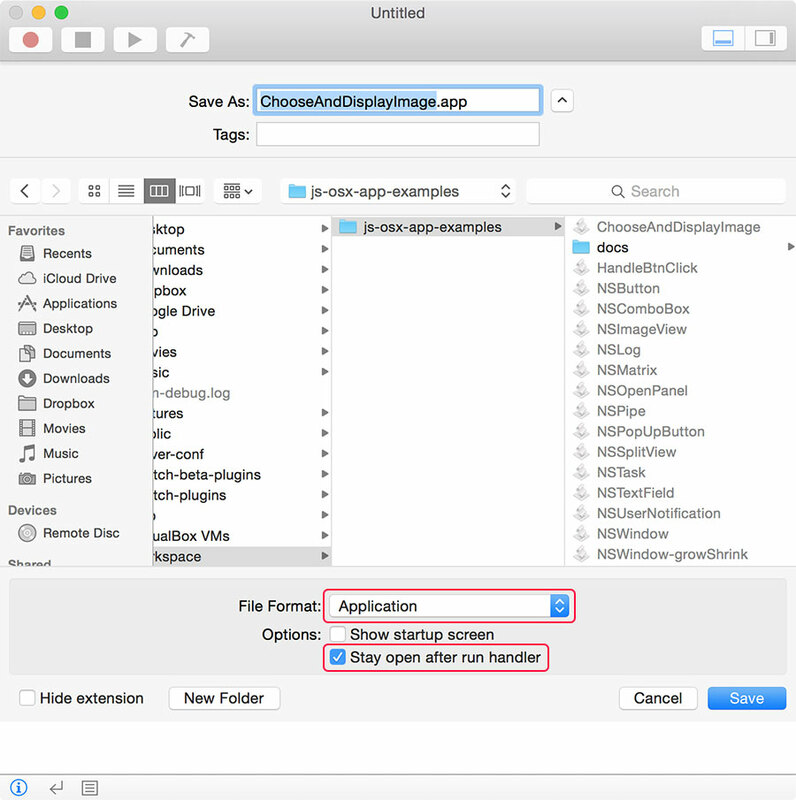 If you donâ€™t select â€œStay open after run handlerâ€� your app will open, flash for a split second, and then close. There is not much in the way of documentation for this stuff online. I only learned this detail after hours of forehead/keyboard merging. Letâ€™s make something do something! Add the following two lines to your script and then run it with Script > Run Application or opt + cmd + r.
Not much happened. The only visible changes are in the menu bar and dock. The app name along with File and Edit menus are in the menu bar. You can see the app is running because its icon is in your dock. Where is the â€œHi everybody!â€�? What is with the dollar sign, what is this, jQuery? Quit the app with File > Quit or cmd + q and weâ€™ll find out where that NSLog went. Open the Console app: Applications > Utilities > Console. Every application can log messages to the console. This console is not much different than Developer Tools in Chrome, Safari, or Firefox. The main difference is you use it for debugging applications instead of websites. Thereâ€™s a lot of messages in the console. You can filter it down by typing â€œappletâ€� into the search field in the top right corner. Leave â€œappletâ€� in the search field and go back to Script Editor. Run the application again with opt + cmd + r.
Did you see it!? The message â€œHi everybody!â€� should have logged to the console. If you didnâ€™t see it, quit your application and run it again. A lot of times I forget to quit and the code doesnâ€™t run again. What about the dollar sign? The dollar sign is your access to the Objective-C bridge. Any time you need to access an Objective-c class or constant, you use $.foo or ObjC.foo. There are a couple of other ways to use $ that Iâ€™ll cover later. Console App and NSLog are indispensable tools, youâ€™ll use them non-stop for debugging. For examples of logging things other than strings, have a look at my NSLog example. When thatâ€™s in place, run the app. opt + cmd + r. Now weâ€™re talking! With a small amount of code weâ€™ve built an app that launches a window with a title that we can move, minimize, and close. If youâ€™ve never built an app with Objective-C or Cocoaâ€“like meâ€“parts of this might look like a lot of gibberish. For me, that was due to the length of the method names. I enjoy descriptive names, but Cocoa takes it to the extreme. Whatâ€™s going on with that first new line where we set styleMask? You use style masks to configure windows. Each style option says what it adds; a title, a close button, a minimize button. These options are constants. Use a pipe â€œ|â€� to separate options. That pipe is a C bitwise OR operator. Iâ€™m not gonna pretend to know what that means. I just know itâ€™s needed to combine style options for a mask and thatâ€™s good enough for me. There are more style options. You can read about them in the docs. NSResizableWindowMask is one youâ€™ll use. Try adding it to the style mask to see what it does. Take a look at the NSWindow docs for that method and youâ€™ll notice it looks a bit different. The thing to note are the colons â€œ:â€� in the original method signature. When you convert and Objective-C method to JS you remove the colons and capitalize the first letter following it. When you see two items in brackets â€œâ€�, that is calling a method of a class or object. [NSWindow alloc] calls the alloc method of NSWindow. For JS, convert those to dot-notation and parenthesis if necessary; NSWindow.alloc. I think the rest of the code to create and display the window is straightforward-enough. Iâ€™ll skip any more detailed description of it. It takes time and a lot of reading the docs to understand whatâ€™s happening for each step along the way, but youâ€™ll get there. As long as the window is showing up youâ€™re doing great. Letâ€™s do more. We need a label, text field, and button in this window. Weâ€™ll use NSTextField and NSButton to make that happen. Update your script with the following code and then run the app. If things worked youâ€™ll now have a window with controls. You canâ€™t type in the text field and the button doesnâ€™t do anything, but hey, weâ€™re getting somewhere. After creating the text fields we set a handful of properties on each to get the results weâ€™re looking for. Cocoa doesnâ€™t have anything like the html label element. For that we make our own by disabling editing and background styling. Weâ€™ll populate the text field programmatically, so we disable editing on it as well. If we didnâ€™t need that, creating a standard text field is a one-liner. For the button we use NSButton. Like the text fields, creating it requires drawing a rectangle. There are two properties that stand out; bezelStyle and buttonType. The values for both are constants. These properties control how the button will render and the style it will have. Check out the NSButton docs to see everything you can do with it. I also have an example app that shows the different button types and styles in action. The last new thing we do is add the elements to the window with addSubview. When I first tried this I did window.addSubview(theView). That works for other standard views that you create with NSView, but not for instances of NSWindow. Iâ€™m not sure why that is, but for windows you need to add sub views to the contentView. The docs describe it as; â€œThe highest accessible NSView object in the windowâ€™s view hierarchyâ€�. Works for me. When clicking the Choose an Image button, we want a panel to open that shows files on our computer. Before we do that, letâ€™s warm up by logging a message to the console when clicking the button. The first thing we need to do is set the button target and action. The target is the object we want to send the action to. If this doesnâ€™t make sense now, just keep going and itâ€™ll get more clear when you see the code. Update the button setup part of the script with the following properties. appDelegate and btnClickHandler donâ€™t exist yet. We need to make them. In the next addition to the script, order matters. I put comments in the following code to show where you should add the new stuff. Run the app, click the Choose Image button, and watch Console. Do you see â€œClicked!â€� when you click the button? If so, thatâ€™s pretty darn cool right? If not, double check your script matches the code here and look for any errors in Console. Whatâ€™s this ObjC.registerSubclass all about? Subclassing is a way to create a new class that inherits from another Objective-C class. Side note; the likelihood Iâ€™m using incorrect terminology here is through the roof. Bear with me. registerSubclass takes a single argument; a JS object with the members of the new object. Members can be; name, superclass, protocols, properties, and methods. Iâ€™m not 100% sure thatâ€™s an exhaustive list, but thatâ€™s whatâ€™s in the release notes. Thatâ€™s all well and good, but what did we do there? Since we didnâ€™t provide a superclass we inherited from NSObject. Thatâ€™s the root class of most Objective-C classes. Setting a name letâ€™s us reference the object later through the bridge with $ or ObjC. $.AppDelegate.alloc.init; creates an instance of our AppDelegate class. Again, notice we donâ€™t use parenthesis with the alloc or init methods since weâ€™re not passing arguments. btnClickHandler wonâ€™t return anything so we set the return type to void. It takes one parameter, the sender object. In this case it will be the NSButton we named btn. We use the â€œidâ€� type because represents any object. The full list of types is in the release notes. You can implement existing Cocoa protocols with sublcasses, but thereâ€™s a â€œgotchaâ€�. I found out that if you use the protocols array your script will just stop with no errors. I wrote an example and explanation that youâ€™ll want to have a look at if youâ€™re doing that type of thing. // NOTE: We bridge the JS array to an NSArray here. The first thing we do is create an instance of an NSOpenPanel. If youâ€™ve ever selected a file to open, or a location to save a file youâ€™ve seen panels in action. We open the panel with panel.runModal. That pauses code execution. When you click Cancel or Open, the panel will return a value. If you clicked Open, the contstant value of $.NSOKButton is returned. The other note about panel.URLs is important. In JS, we access the first value of an array with array. Because URLs is an NSArray we canâ€™t use bracket notation. Instead we use the objectAtIndex method. They both give the same results. We create an NSImageView using the same process we did for creating other UI elements. imgView handles displaying the image. We want to change the width and height of our window to match the width and height of the image. We also want to make sure we donâ€™t go below a minimum width or height. We use setFrameDisplay to change the size of the window. We wrap things up by setting the image view image and adding it to the window. Since its width and height have updated we re-center the window. And thatâ€™s our little app. Kick it around, open a bunch of images. And yes, animated gifs will display and play so be sure to try some. So far, weâ€™ve been running the app from Script Editor with opt + cmd + d. You run the actual app by double clicking its icon like any other application. You can update the app icon by replacing /Contents/Resources/applet.icns. To access the app resources, right click on the app icon and choose â€œShow Package Contentsâ€�. Iâ€™m excited about this because I think it has a lot of potential. Hereâ€™s how Iâ€™ve been thinking about it. When Yosemite is available, anyone that installs the OS will be able to sit down and write a native application. They will be able to do so using one of the most ubiquitous programming languages that exists. They wonâ€™t need to download or install anything extra. You donâ€™t even have to install or open Xcode if you donâ€™t want to. That removes a massive barrier to entry. Itâ€™s incredible.